HarePoint Thumbnails for SharePoint allows you to display document and image thumbnails directly in SharePoint document or picture libraries. It provides the very convenient opportunity to preview documents instead of downloading and opening it. 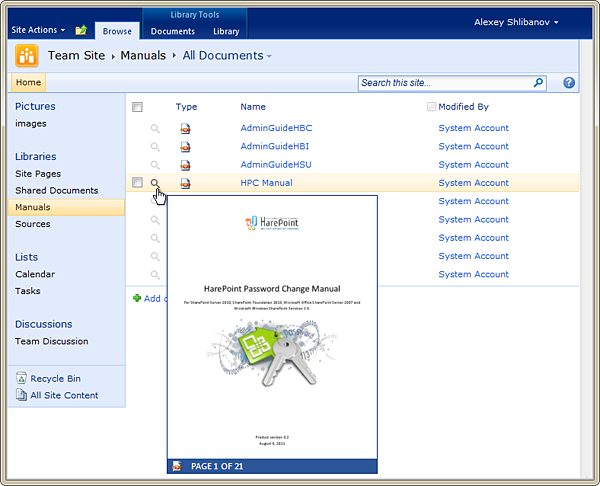 Product features: thumbnail generation for the most common file types: Microsoft Office, PDF, images, e-mails, web-pages; custom thumbnail appearance; and SharePoint 2013, 2010 compatibility.